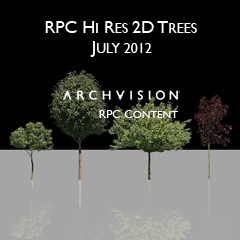 We are proud to announce the July 2012 Deciduous Tree Additions Collection featuring 4 distinct Deciduous Trees. These deciduous trees include the lofty Deciduous Tree , dense leafy Deciduous Tree , wide branched Deciduous Tree  and the vibrant maroon Royal Maple . These trees are ready to plant their roots into your next 3D forest or landscape rendering project with just few mouse clicks. ArchVision Software License (Both Node Lock and Floating License) customers now have access to these new hi-res RPCs and thousands more.